Mushroomhead delivers at the Ace of Spades in Sacramento. Classic (hed)p.e. at the Ace of Spades in Sacramento. 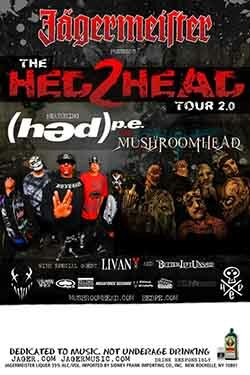 Mushroomhead and (hed)p.e. team up for a full US tour with support coming from Better Left Unsaid the Hed 2 Head Tour 2.0. The tour started April 15th, 2011 and ran through June 10th, 2011. Watch the killer show from the Ace of Spades in Sacramento on April 4th.